Oh what a difference some lighting makes. . . I got a couple of clamp on lights from Home Depot and used the macro setting on my point and shoot. . . Learning. I'm still baking for the Gourmet Supper club. All morning long I've been baking these Pecan brown sugar cupcakes with salted caramel frosting. If you're going to make these be sure to toast the pecans the night before and leave ample time to let the frosting in all it's various stages cool. They're delicious. For some reason my picture of these came up as a separate post, so if you want to see what they look like check out that post. 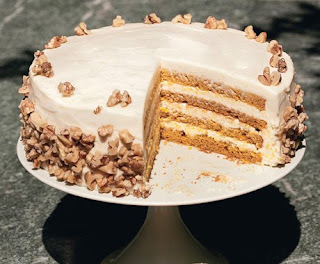 So I am preparing for a Gourmet supper club thanksgiving dinner, and one of the things I am making is this Four Layer Pumpkin Cake. I am in the middle of making it now and have just used my handy dandy cake slicer thingy to cut the 3" high cake into four levels. The cake looked dreadful after being frosted, so I stuck it in the fridge and made another half batch of frosting which I was able to fix it with. 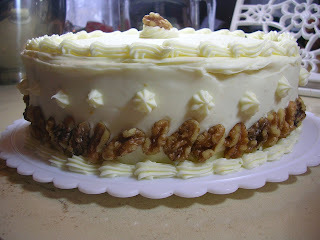 The top two pictures are my cake and the bottom one I borrowed from the Gourmet website. . . 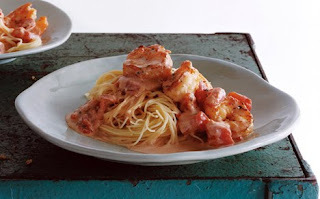 This is a family favorite, Capellini with Shrimp I've gone through entire bottles of vermouth making this over the years (I don't use it for anything else. . . so that should say something) It's great for a quick supper, or for company. All my kids will eat it! I always brine my frozen shrimp in a mixture of 1/3 cup sugar, 1/3 cup chili powder (mc cormack's in a giant bottle from BJ's) and 1/2 c. diamond kosher salt in my big white bowl (I think it holds 10 cups of water) Use hot water, throw in the frozen shrimp and wait 20 min. Drain, but don't rinse. . . there will be chili powder left on the shrimp, this is o.k. I usually use a whole pound of pasta. . . with the same amount of sauce. Frankly I didn't read the recipe correctly the first time (and who makes 1/2 a pound of pasta anyway??? I have 3 kids that would never occur to me) and it came out really well. Just save a good amount of pasta water. This has been a favorite for years, it is based on Italian Red Lentil Soup from a nifty little cookbook that I don't see anywhere but that has lots of gems in it: Healthy Cooking for Kids by Shelly Null. I always double the recipe for our family of five. sautee the onion in the olive oil, add the garlic and carrot. Add the water and bring to a boil. Add the salt and lentils. Cook for 10 minutes, add the pasta and simmer for 10-15 more minutes. . . nothing more. I serve this with foccacia made with the Artisan Bread in 5 olive oil dough cooked in an 8"round cake pan with olive oil, rosemarey salt and garlic (also a good idea to make 2 - which uses the entire recipe) This is a great bread to make sandwiches with roasted vegetables and cream cheese on. . . yum. So I started this blog in a hurry to get into the bread braid. . . and I didn't put any background about myself. I love to cook and bake, always have. 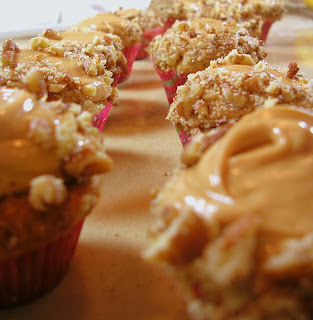 I am a mom of 3 kids (10,7, and 4)who are homeschooled, they're pretty good in the kitchen themselves. About 2 years ago I had been delving pretty seriously into bread, a lot of Peter Reinhart stuff (which is all about the slow). My husband got me the book Artisan Bread in Five Minutes a Day I figured it would be 5 minutes a day for a week (or 2) then a loaf of bread. Boy was I wrong. I've been crazy about this book since I read it and tried the recipes. . . They actually meant 5 minutes, - 5 to mix up a huge batch and 5 to shape it when you want it. let it rise and bake it then you've got some seriously good bread! The thing is that before this I was a pretty serious whole grain baker. I even have my own flour mill. Well ABin5 threw all that to the wolves (much to the delight of my children). Now I've got my hands on Healthy Bread in 5 Minutes a Day (the new release) and I'm trying to get back with the grain (much harder than going the other way I'll admit). So I've joined a group HBin5 and we are going to cook our way through the book and post our results on our blogs. . . So that's the background info. The other big news in my cooking world is that after 23 years as a vegetarian (well, pescatarian - but that just sounds pretentious) my children have encouraged me to give it up. Now I'm learning to cook meat and poultry - which can be daunting. So this blog will mostly be about all that, hopefully my food photography will get better as I go along, I know it's not great now, it's a hobby I always meant to cultivate. . . These are the un-iced cinnamon rolls, my 4 year old did make an icing of powdered sugar and cream which was spread all over them, but that picture came out weird. . .
Well in a timely fashion (a.k.a. on the day I start a blog) my computer has refused to acknowledge my camera. When Nikon figures out why I'll post some pictures. 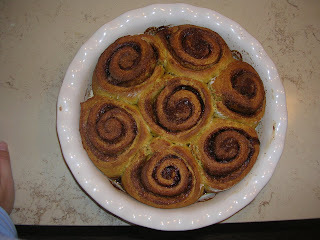 The cinnamon rolls made with Pumpkin brioche were really good. The loaf of pumpkin pie brioche seemed a bit dense to me. . . very different from ABin5 regular brioche. So I made a batch of HBin5 pumpkin brioche and I split it up, half into cinnamon rolls which are torturing my kids in the oven as we speak, and half into a loaf designated for French toast in a day or two. Then I realized I really needed a blog unless I wanted to invite everyone to be my friend on facebook. . . so here I am. I'll post photos when they're done. 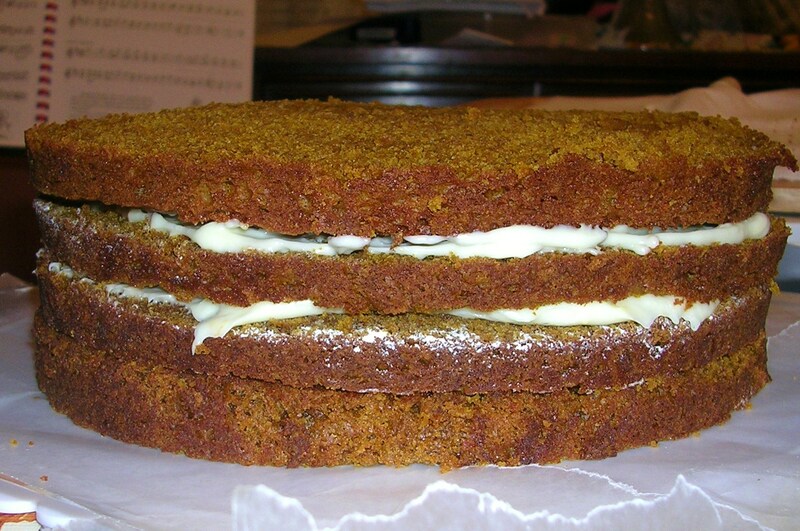 Here is a LINK to the pumpkin brioche recipe.